HDPE (High Density Polyethylene) is a higher density version of PE (Polyethylene). A linear polymer prepared from ethylene by a catalytic process, the difference from LDPE is the absence of branching in the chain, causing a more closely packed structure to form than in LDPE. This creates not only a higher density material, but also higher chemical resistance than its low density counterpart. It is harder, stronger heavier and more opaque than LDPE and PE. HDPE can be processed in a number of ways including: plastic molding, plastic injection molding, extrusion, film blowing and blow molding. HDPE is used for many packaging applications because it has excellent moisture barrier properties, and is lightweight and flexible. 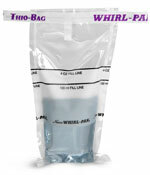 HDPE plastic has good resistance to chemicals which is why it is commonly used to package many laboratory substances. HDPE can be sterilized by gas, gamma irradiation and chemical disinfectant. HDPE is found in many forms such as film, blow molded bottles, and injection molding. In film form HDPE is used in snack food packaging as well as cereal box liners. In blow molded bottle form, HDPE is used for milk and non-carbonated beverage bottles. In injection molded tub form HDPE is used to produce packaging for margarine, whipped toppings, and deli foods.